A biennial Magazine published by the Universal Theomonistic Association, Inc.
Washington, D.C.. Publisher: Universal Theomonistic Association. Editor: Bishop Theodolithos (Helmuth P. Holler). 1/1, 1919-1920(?) 50 cents a copy, 28 pp. This was the product of the group that published the Holy Theomonistic Bible "as revealed by ELOAH, the Almighty God of the Universe; by Jehovah, Father of our own Solar System; by Basa Jesus Christ Xeovah, the only rightful King of Earth, and a large Host of Earthborn and Non-Terrestrial Angels, through mediumistic Automatic Writing of Mrs. Welari, the Clairvoyant Inspiration of the Editor, Bishop Theodolithos, S.D.D., and the guidance of their soulmates, Theodolinda and Bishop Phillips Brooks (1919-1921), a title that tells it all. Theodolithos was Bishop Helmuth P. Holler, Ph.D., S.D.D., Ll.D., etc., President of Oriental University and First Promoter (and discoverer) of Universal Theomonism. Holler's wife was called, for unknown reasons, "Mrs. Welari." Theodolinda was his daughter, Evangeline, and Bishop Phillips Brooks was the spirit of the deceased Episcopal bishop of Boston. Holler, a German-born former Lutheran missionary, first announced Theomonism ("monistic theism") in 1907 from his theological education, especially in the early Christian fathers and Gnostic writers, his missionary experiences in India, and his explorations of the cosmic hierarchies with his mediumistic wife and daughter--using a planchette-like writing device he called a "wondergraph." This produced a wonderfully strange symbolic alphabet communicated by Phillipus, "one of the seventy disciples (of Jesus) from the 30th sphere of heaven," together with the key to understand the letters. 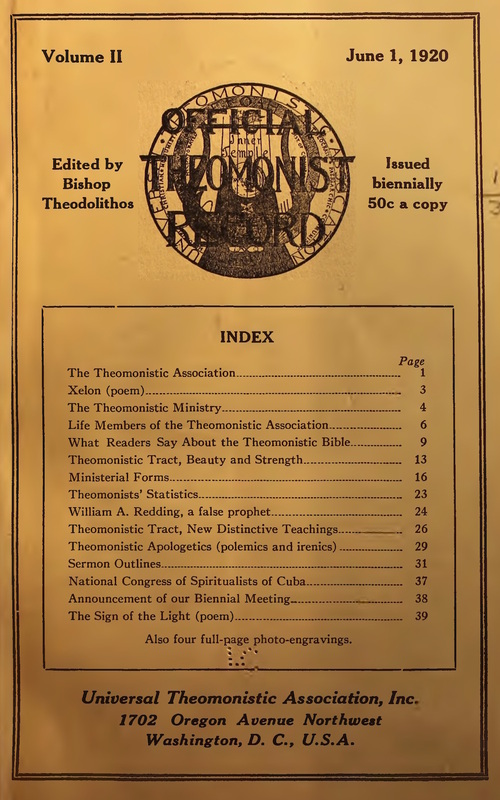 Theomonism announced, in a manner reminiscent of John B. Newbrough's earlier Oahspe, which Holler acknowledged but deprecated, the unfolding of the cosmic all from Eloah through Jehovah, "the minor god of our own particular solar system and one of the great sons of God called 'Elohim,'" and the succession of world-ages that culminated in 1916 in the Theomonistic Era. As was to be expected from the founder and president of Oriental University, on which see the note under Oriental University Bulletin, Holler organized the Universal Theomonistic Association in a way to maximize his own revenue: Theomonistic Licenses cost $7.50 and Theomonistic Ordination Certificates $10.00, and were offered worldwide. These entitled the bearer to clergy rates on the railroads, but for those who wanted to establish churches Holler offered for $175.00 a complete set of equipment: charger, copies of the Holy Theomonistic Bible and various tracts, the Oriental University Bulletin, an aluminum communion service (with 45 crystal glasses), and 500 communion wafers. LOC.